It’s been almost 2 years to the day since I last posted on this site. Crazy how time flies, #amiright?! I have since rebranded as travel & lifestyle blog Marion Ave. In my last couple years of college, I went through a lot of transition, and I wanted my online presence to reflect that. There were so many “big girl” decisions to make, even more so now that I’ve graduated. Marion Ave is meant to offer advice and encouragement to fellow post-grads who are seeking community and attempting to find their place in the world. Thanks again to those of you who followed Brooke Reviews… as my first “blog,” this site will always be special to me and I’m so appreciative of the book-blogging community and for everything I learned about writing, photography, graphic design, and social media. I hope you’ll follow me to Marion Ave, I’d love for you to join the fam. I’ve been reflecting a lot lately on all that I learned and accomplished in 2016, and about my approach for continued growth in 2017. New Year, new resolutions, etc. I love the idea of taking time to look back on the successes / challenges of the previous year in order to move forward. So today, I thought I’d write about goal setting for the new year, and, more specifically, how to challenge yourself to be better in a variety of ways. In 2016, I really pushed myself outside my comfort zone – moving overseas to study abroad in London for 4 months, taking on my first summer internship at a magazine, taking an adult ballet class with a friend. And I’m really proud of myself for doing all those things. Best of all, I loved each of those experiences. 2016 was an awesome year. I’m the type of person that’s always striving to be better – to continue learning and growing in all things. I’m very driven. But at the same time, I appreciate routine and will sometimes only do the things that make me feel comfortable. I think it’s probably safe to assume that nobody enjoys – much less seeks out – situations that make them uncomfortable. But, looking back, I’ve realized that it was precisely those uncomfortable situations that caused me to grow as a person. And I’m currently really happy with where I am today. Something else you might be able to relate to is that feeling of pressure to “top” your previous successes. It’s difficult for me to think about where I was this time last year – in London! How could anything I do in 2017 be more exciting than that?! It’s true – my study abroad experience was a pretty big deal, but largely because it was truly a once-in-a-lifetime experience. And just because I may not have another “once-in-a-lifetime” experience in 2017, doesn’t mean I can’t continue to learn and grow. I can absolutely continue to move forward, but I’ll be moving in new directions, and that’s exciting in and of itself. So I’ve asked myself recently, What can I do in 2017 to push myself outside of my comfort zone? First things first… when I left you in August of 2015, I was beginning my sophomore year of college. And, more importantly, I was preparing for a trip across the pond. Because in spring of 2016 (exactly one year ago! ah! craziness! ), I studied abroad in London, England for the semester. At that time, I thought I’d be starting a new blog to chronicle my study abroad adventures and to write how-to posts about travel and all-things college related. I’ll give you a hint – the new site didn’t get off the ground. I registered a domain name and picked a WordPress theme and designed a logo, and then I ran out of steam, probably because I realized it’s pretty difficult starting from scratch and I had a whole lot of other things on my mind. I can’t even believe summer vacation is drawing to a close. I go back to school on the 24th – I’d like to take the next week and a half to prepare for classes and to think about the focus/direction of the blog. Although I won’t be posting during this hiatus, feel free to reach out to me via email or social media! First of all, I’d like to admire the beautiful prose of Rachel Hartman. She’s a wordsmith. My reading experience was enjoyable largely thanks to Hartman’s lyrical writing style. And maybe the lyrical style is due in part to Seraphina’s musical talent and the impact of music upon the story? Anyhow, the book flows seamlessly – one scene into the next. I couldn’t put it down because it was so fluid. Seraphina is a very distinctive narrator and I loved her unique voice. She’s very literal and dry but also hilarious. She’s very relatable, and I know that’s a cliche thing to say, but I think it’s true. She’s struggling because she doesn’t fit in, and this is something many readers will understand and also sympathize with. But Seraphina isn’t whiny or self-pitying, and that’s what I loved best about her. She does what needs doing and nothing will stand in her way. Enter Princess Glisselda and Prince Lucian Kiggs, who have also found places in my heart. At first glance, Selda seems to be the spoiled, stereotypical princess. I’ll give you a hint: she’s not. And Kiggs is absolutely endearing and adorable. The sparks between Seraphina and Kiggs gave my stomach butterflies. Also, Orma, who shares a special bond with Seraphina. I couldn’t be happier with the development of that bond. Hartman has created an incredibly intricate story world. It practically leaps off the page. The history and the relationship between the humans and the dragons is rife with tension. The humans fear the dragons, and the dragons condescend to the humans. The dragons look down on the humans for succumbing to their emotions. So there’s the underlying theme of love – something the dragons adamantly avoid but are seeking to understand. And as far as plot goes, it’s intriguing. There’s a murder and a mystery. Seraphina and Kiggs are detectives hot on the trail. So there’s the whole whodunnit? element, but also a good bit of politics. And it wasn’t predictable. I’m super excited to get my hands on book 2. 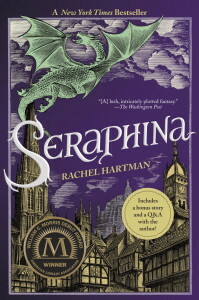 I’m totally invested in Seraphina’s story and her story world. Read it, read it, read it! Dragons, mystery, romance, humor, what more do I need to say?! HAVE YOU READ THIS BOOK? SHARE YOUR THOUGHTS! AH, retellings! My new obsession. 😉 And I’m loving how diverse retellings are becoming – diverse characters, diverse genres. It’s no longer the same-old same-old (modern-day Cinderella, Snow White, etc.) It’s exciting. So I’ve listed five fairytale retellings I’ve read, and five retellings I’ve added to my TBR. Enjoy! *Can we take a moment to admire how fantastic these covers look side by side? The premise is intriguing. I liked the whole spy thing and the reluctant soldier thing. It’s a bit slow in the beginning – the book opens with the murder of Laia’s grandparents and Laia’s subsequent separation from her brother. Laia is a sympathetic character – I felt for her not only because her family has been ripped apart but also because she’s struggling with the guilt of leaving her brother behind to save herself. She wishes she were more brave, more courageous. She’s disappointed with herself, but rather than wallowing in self-pity she seeks out the rebels, who may be the only people who can help rescue her brother. I’m not always a fan of alternating perspectives, but Tahir pulled this off really well. Both Laia and Elias are strong narrators. It becomes especially interesting when their stories intertwine at the military academy. Although honestly, I’d have to say I liked Elias more than I liked Laia. Her emotional struggle endeared me at the beginning, but she became too bold too fast, and this was a little unrealistic. Anyhow, it’s difficult for me to get my feelings across because even though I really enjoyed it, there were several things that skewed my satisfaction. A review I read by a fellow blogger also pointed out the lack of world building. I actually hadn’t thought much about this, because I’d been so engaged. But there’s very little backstory/explanation/history provided for the Martial Empire. I walked away with more questions than answers. I sound a bit negative, but this is just one of those books that gives you equal parts enjoyment and frustration. I’d still highly recommend it simply because it’s an engaging read. But I wanted to be honest with you about the drawbacks. HAVE YOU READ THIS BOOK? SHARE YOUR THOUGHTS!! “What are you doing with all those books anyway?” Ron asked. “The library,” Liz said, and immediately I knew that she was right. It was exactly like the library at the Gallagher Academy, from the position of the fireplace to the tall windows that overlooked the grounds. “How do you know?” Zach asked. Have you read these books?? Who are your favorite book nerd characters? Share your thoughts! Give me recommendations! 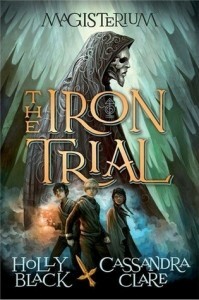 I don’t typically read much middle grade, but I’m a huge fan of Cassandra Clare and the premise of The Iron Trial totally intrigued me. A book about a boy who purposefully tries to FAIL the entrance exam into magic school? I’m sold. I started reading, and the very first chapter completely hooked me. Not only does it introduce the story world and the major conflict quite spectacularly, but it’s also an ingenious bit of foreshadowing. So major props to Clare and Black. Just as we’re told in the summary, Callum Hunt fails at failing, and he’s admitted to the Magisterium. His dad didn’t want him to go. Call doesn’t want to go. But as the story progresses, Call comes to appreciate his training and also his new friends. I have such a soft spot for Call. He’s sort of bitter and sarcastic, but he’s not mean. He’s actually quite funny. And he has a crippled leg, which definitely presents unique challenges for Call and sets him apart from other stereotypical MG and YA characters I’ve read. I love the strong friendship between the three apprentices, Call, Aaron, and Tamara. The plot is interesting and engaging and hints at exciting revelations in the following books of the series. The plot twist at the end of Book 1 (which I sort of guessed!) is absolutely FANTASTIC. Prior to reading the book, I read a review which pointed out similarities to Harry Potter. And so when I read The Iron Trial, these similarities really jumped out at me. That said, it didn’t affect my reading experience or my opinion of the book much at all. Got my hands on an ARC of The Copper Gauntlet, which was very exciting because I was still reading Iron Trial at the time and couldn’t believe my luck. 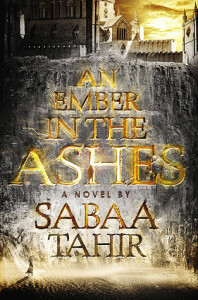 Not sure how much I can say, as I should probably wait until closer to it’s release date, but it has all the features of Book 1 I loved – magic, adventure, tension, intrigue. Call is hiding something big from his friends and so he’s facing questions of trust and loyalty. Another enjoyable read! I'm Brooke Harrison - I'm a 20-yr-old writer and voracious reader. Welcome to my YA book blog!